We are excited to bring you a new chocolate company from just south of San Francisco which is pushing the boundaries of flavor combinations: Philip Marks Chocolates. They use only high quality ingredients and chocolate to create unique flavor profiles. Fairly new to the chocolate world, the company has only been around for about five years, but the founders have had a love of chocolate for decades before that. Philip Marks Chocolates was created by friends Philip Marks and Lynne Israel. Philip is a successful travel agent specializing in DJs and bands and met Lynne when she contacted him to help with her elopement over 20 years ago. The two became instant friends. Philip has always had a passion for chocolate and food—his two sons are even chefs—so he decided that he wanted to start a company that focused on unique flavor combinations with his favorite ingredient, chocolate of course! When Philip, originally from New Jersey, called Lynne with his concept, he told her he wanted to call it “Betta Bitta Chocolate” (Better Bitter Chocolate, think exaggerated New Jersey accent). Lynne who has a marketing background immediately shot that down. She went on to convince him to keep it simple and memorable and said that Philip Marks Chocolates is the perfect name. Before Philip Marks became what it is today, Philip and Lynne spent three years learning everything they could about chocolate. They literally tasted their way around the chocolate universe to know what chocolates from different parts of the world tasted like, where they came from, and how different percentages of cacao change the flavor profiles, thus becoming true chocolate experts. When it came time to make the actual chocolates however, Lynne said it was somewhat of a disaster. They tried a few times before realizing they needed someone who could help bring their ideas to reality. Luckily for them, they found the perfect man; enter Kevin Turnbeaugh. Kevin Turnbeaugh has had a love of everything sweet since he was kid. He has memories of helping his mother bake cookies and cakes, and instantly feel in love with it. In 2010 he decided to finally put his passion to work and enrolled in the prestigious Le Cordon Bleu Academy of Culinary Arts in Sacramento, CA. There he not only perfected his baking techniques but learned about all kinds of foods and flavors including savory profiles. Once he graduated, he started work at a chocolate shop in southern California baking cakes and learning all things chocolate. There, the head chocolatier taught him the delicate art of chocolate making, including tempering, and Kevin instantly fell in love with the process. Kevin says that he appreciates the delicate nature and time it takes to make the perfect piece of chocolate. Dark Chocolate Bar 68% - This 68% Bolivian dark chocolate bar is complemented by the aroma of fresh lemon and a hint of fruity grapefruit. This unique combination with single origin cacao beans creates a very smooth and slightly bitter finish for the sophisticated palate. White & Dark Marbleized Chocolate 88% / 36% - This handmade duo of white chocolate and strong dark cacao is supplemented by a licorice note which then transitions into a subtle roasted coffee flavor. This unique combination of 88% dark Maracaibo swirled with a creamy 36% Edelweiss white chocolate is the perfect balance to please your palate. White Chocolate Black Roasted Sesame Seed Bark 36% - Sweet and creamy white chocolate bark topped with black roasted sesame seeds and a pinch of Japanese sea salt. Dark Chocolate Cashew Bark Turbinado Sugar w/Japanese Sea Salt 72% % - Dark Chocolate bark with twice roasted salted cashews and a sprinkling of a maple inspired turbinado sugar and Japanese Sea Salt make this a delight for the senses. The intensive coffee and licorice notes make this dark 72% Arriba bark an unforgettable experience for your palate. Dark Chocolate Raisin Bark 72% - Medley of jumbo juicy raisins; Seedless golden and an array of Flame raisins are enhanced with the 72% Arriba creating an unforgettable experience for the senses. The traditional, gentle processing method develops a powerful prune bouquet, which finishes with a light, almost flowery black currant note. Dark Chocolate with Orange Slices 72% Arriba 72% Dark Chocolate Bark with natural dried orange slices. This sweet and moist orange bark is full of wonderful citrus with a dark prune bouquet which finishes with a light, almost flowery currant note. 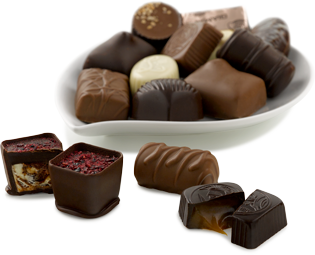 We know that you will love their chocolate as much as we do! 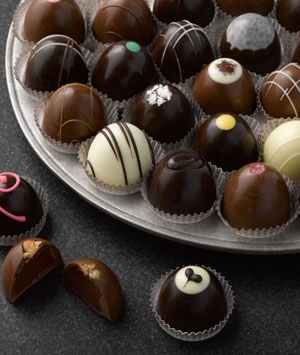 To see other kinds of chocolate confections they make, visit their website at: philipmarkschocolates.com.